Hi everyone! Welcome to the GCD Studios Blog Party! Be sure to start your blog hop over at the GCD Studios blog and then just follow the links to each of the design team members. Leave some love along the way especially at the last blog on the list for your chance to be entered into a random drawing to win the collection of the day. Easy peasy, right? Now head on over and visit Lori to see what goodies she has whipped up with this new collection! I love those pictures!!!! Great layout! Very cute! Those photos are too cute! Haha love that face! Way cute. I love that photo! :) And I'm enjoying the hop! that photo is priceless! great layout! wow I am in love,great layout and the pictures are awesome! What a great layout! Love how you did the photo strip along the left side. Very cute layout! I love how bright this layout is! I love this page...it is soooo cute! You always have such a knack for pulling stuff together beautifully! awesome - that picture cracks me up!! ha! those photos are great!! The face your son is making is priceless!!! Love this layout! too cute! love your layout!! Great layout! Love that paper! Gorgeous layout! The pictures are fantastic! Love it like always!!!! great combo of papers. tfs! This is a fun layout! His face made me laugh. Great page!! Great job!!! Love the pic's.. Thanks for sharing your layout with us. I'm always lost on masculine layouts! Ohhh, this page inspires me. I love the papers you chose and the funky layout is awesome! Cute kid. Thanks for sharing. 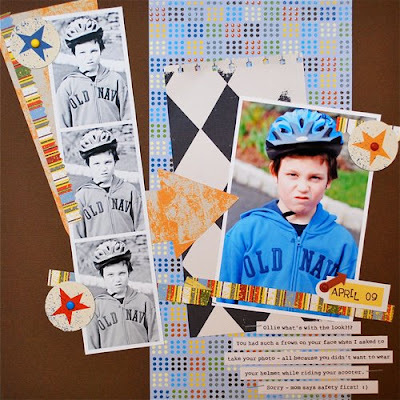 Awesome layout - really love the pictures and the journal strips! great photos!!! such a cute and funny layout! love that layout and man he doesn't look happy in that pic. I really like the way you placed the pp's and the pics..
His facial expression is priceless! Great layout using multiple pics! Hmmmm, glad I'm not the only one who gets those looks for pics LOL!! I scrap them, too.... it shows that particular "stage"! Love it!! I'm really enjoying seeing how the DT approached these vintage boy papers! Oh that is fabulous! Thos pics are priceless! Love your layout! But then again I am a lil biased..
still think you rock !!! Fab LO girl, love the B/W and color photos together! I love this layout! You did a great job with these papers. Thanks for sharing. Love his face in those photos! Fabulous! Lynn, I always love what you create. This is awesome. this is one fabulous layout! the photos are perfect!